An outfit for “Today’s Bride” of 1941, virtually as streamlined as any 1941 warplane. Because the bride was practical, the wedding gown was two-piece — ditch the coat and wear the sleeveless gown alone to dances. 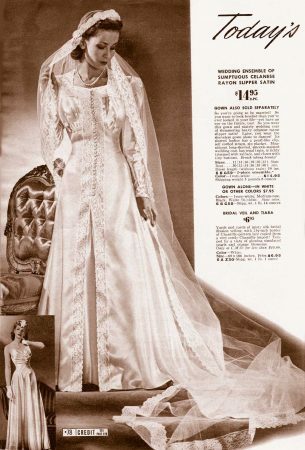 Because “all eyes (are) on your figure as you walk down the aisle” everything is smooth and satin-y. 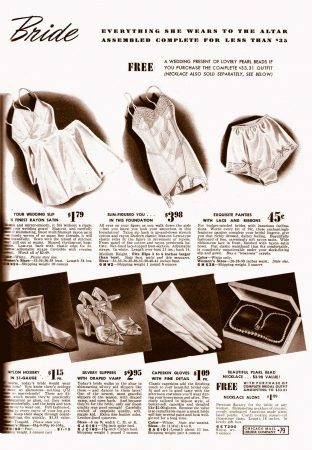 Because the bride was modern, her stockings were made of Nylon, the man-made wonder that looked and felt like silk. From the “Chicago Mail Order” company (an uninspired name but certainly a clear enough one) the complete bridal outfit as pictured on these pages was only $33.31 – and you’d get the fake pearls for free! Next Next post: What Makes a Woman Swoon?